Please consider joining us for the 8th Annual John Thompson Memorial 5k Run/Walk and One Mile Kids Fun Run! This event is held on the campus of Neshannock Township School District which includes a very flat 1/4 mile section of the nature trail (weather permitting). 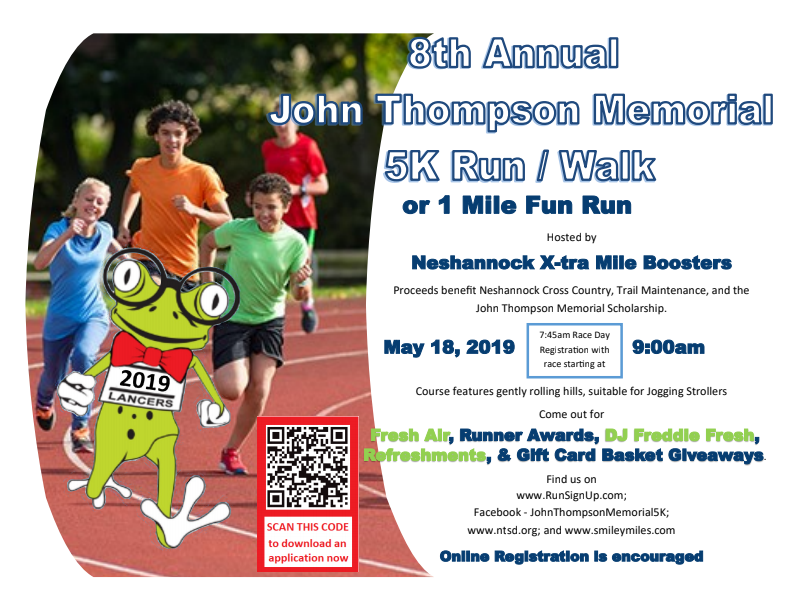 This race, hosted by Neshannock Xtra Mile Boosters, benefits the Neshannock Cross Country Team, the maintenance of the John Thompson Nature Trail, and the John Thompson Scholarship. Pre-registration is recommended (see links below). Race day registrations accepted! This event is a chip timed race on the campus of Neshannock Twp. School District which includes a very flat 1/4 mi. section of the nature trail (weather permitting). This race benefits the Neshannock Cross Country Team, the maintenance of the John Thompson Nature Trail, and the John Thompson Scholarship. Registration begins at 7:45 am behind Neshannock High School in the stadium. Awards given to: Top male/female finishers overall and Top 2 male/female finishers in the following age groups-1-14, 15-19, 10 year age groups up.